This must be the ghost of Syd Barrett who is recorded onto dictaphone. Tiny songs full of tape hiss and reverb. You always hear the click of the record button at the beginning, then some pretty remindable melodies, a whispering voice and ghosts that speaks through the tape hiss. Then clicks the stop button and the ghosts voices are still present in your room, in your head. But they would not harm you. They are like friends. low-fye was born in the mid 80s and started writing music in the mid noughties after listening to and being inspired by such artists and bands as: Elliott Smith, Guided by Voices and Daniel Johnston. Recording with a beaten up epiphone acoustic and a small digital 4-track, low-fyes songs are sparse and minimal but retain a degree of ethereal charm and originality that draws listeners in and holds their attention. There is no specific method for the way low-fye writes songs. Everything is done in a spontaneous manner. The record button is pushed, a few edits are made and a song is produced. Everything here was recorded in a small terraced house in north wales. 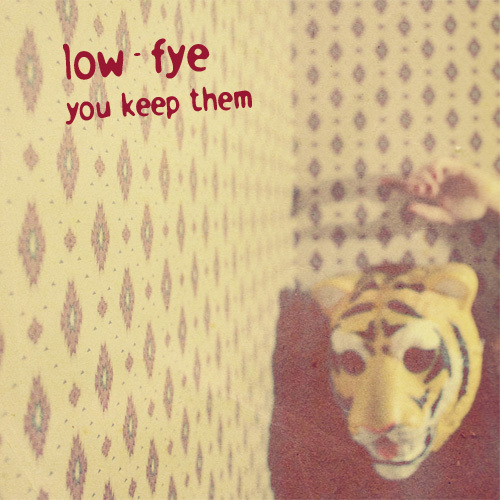 “You Keep Them” by Low-Fye (that band name being a pointer to the contents) is the work of Tom Hayes, a singer songwriter from North Wales whose songs – start/stop clicks, hiss and all – are recorded on this album. Although not entirely one-man-and-his-guitar (there are overdubbed backing vocals for instance), the feel is lo-fi, though never overtly so. Most tracks clock in at a couple of minutes. ‘And I’ is mournful, while ‘Smoking On An Empty Stomach’ and ‘Vein’ remind the listener of artists such as The Child Readers. Tracks like ‘Known To Crush’ inevitably evoke Gorkys Zygotic Mynci, whose brand of idiosyncratic Cambrian psychedelia must have influenced this musician. 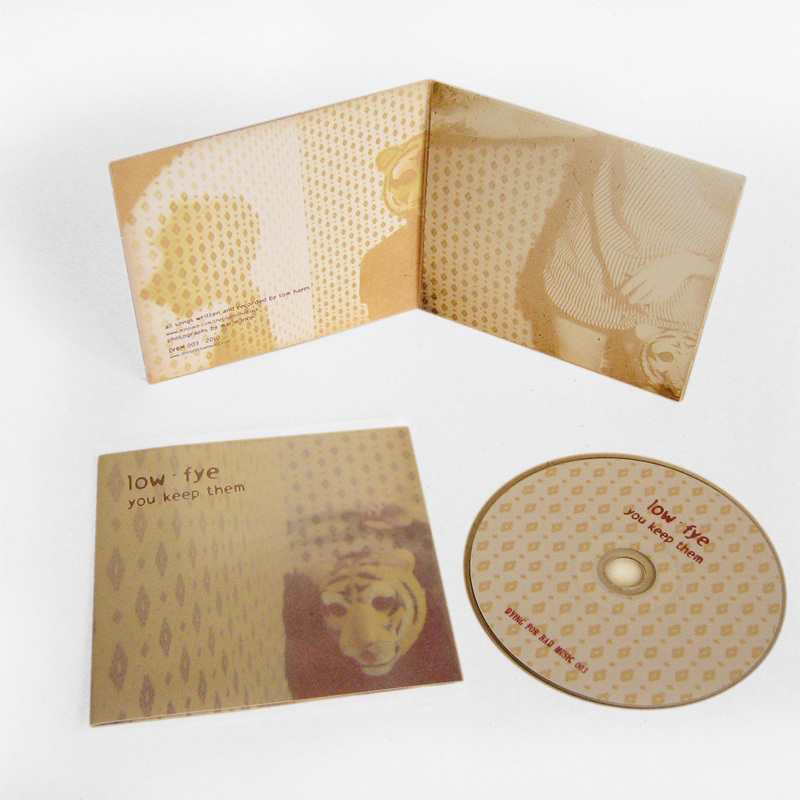 One of the highlights of the album is ‘Drowsy’, with its strong melody and strange lo-fi/hi-fi production. ‘Neuropathy’ evokes the kind of delightful bucolica pioneered by Dave Gilmour in the late ‘sixties, while ‘The Click’, with its great vocal performance, is another strong cut. ‘Symptoms’ is set on a bed of echoed vocal effects, the song then transmogrifying into another Gilmouresque acoustic strum; really nice. ‘That Same Bird’ is eerily mournful, while album closer ‘Voices’, short and sweet, merges radio/TV sounds and gorgeous guitar arpeggios. A most intriguing album. Incredible. You are a true original. This is bloody fantastic. Fantastic, Simple and direct. Perfect. There’s a lovely naive simplicity to your work that is so reminiscent of Syd Barrett. But it doesn’t sound basic. Echoes of Nick Drake as well. I find your work quite touching (if I can say that without sounding like a big girl’s blouse). Oh My God, Syd you’ve come back to us… Amazing. You’ve got a very definite, and definitely delightful style. I like the ambient noises and the simple, lo-fi approach. It’s such a tonic to the overproduced stuff we hear everwhere these days. You have something very good going on – keep it going!